Alex Huegen, 14, of Bartelso, a Special Olympics Illinois athlete and Global Messenger, represented Illinois at Special Olympics’ 12th annual Capitol Hill Day on March 18 in Washington, D.C. 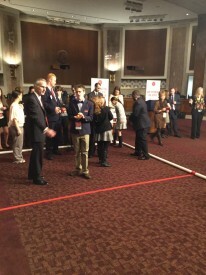 Throughout the day, Special Olympics athletes held face-to-face meetings with their Congressional representatives to advocate for continued federal support for critical health and education services provided by Special Olympics that transcend the playing field and transform classrooms, communities, and lives. Below is Alex’s first-person account of his trip. 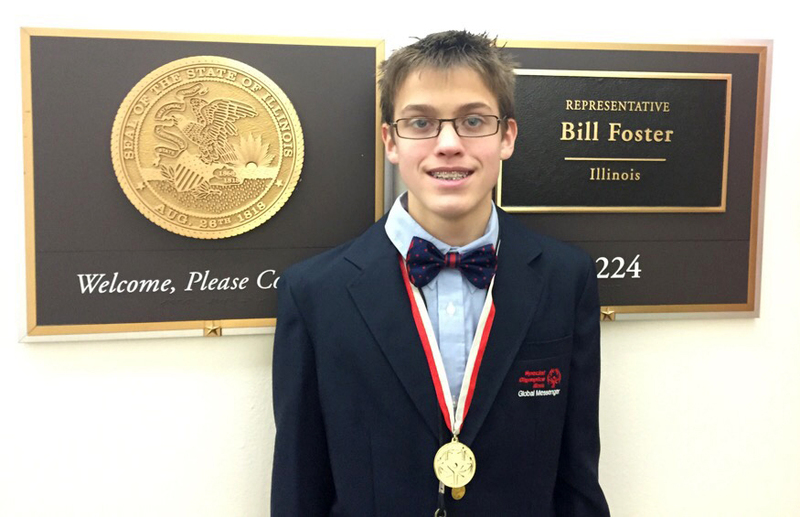 When I first heard that I was chosen to be a delegate from Illinois at Capitol Hill Day in Washington, D.C., I was shocked and excited that I was actually getting this once in a lifetime chance to be able to go to D.C. and speak to the representatives and senators about Special Olympics. Before I left, I learned who our Illinois senators and representatives are. I had an early morning on Tuesday, March 17. I woke up at 5 a.m. because we (my mom Crystalyn and I) had to leave the house at 6 a.m. so that we could catch our early flight. Right before SOILL President & CEO Dave Breen got to the gate, I met the delegates from Missouri going to Capitol Hill Day. I couldn’t believe that we were flying on the same flight as the Missouri delegates. During the flight, Coach Mom told me what I had to know for the event. After that, I got to relax until we landed in D.C. Dave, Mom and I got into a cab and went to the hotel where we checked into the room, got settled and ate lunch. At 3 p.m., we went to a training where a few people spoke to us about what we had to do. I learned that I am important and worth the money spent to send me to D.C. I made sure to tell all I was meeting how important I am and how important Special Olympics and Project UNIFY is! Wednesday, March 18, started early again. We ate and then got on a bus to get to Capitol Hill. Once we got there, we saw two representatives and five representative aides. Rep. Tammy Duckworth showed me her challenge coins, reminding me of the one I got from Fairview Heights Police Department for speaking. I met Rep. Mike Bost who said he slept in his office. 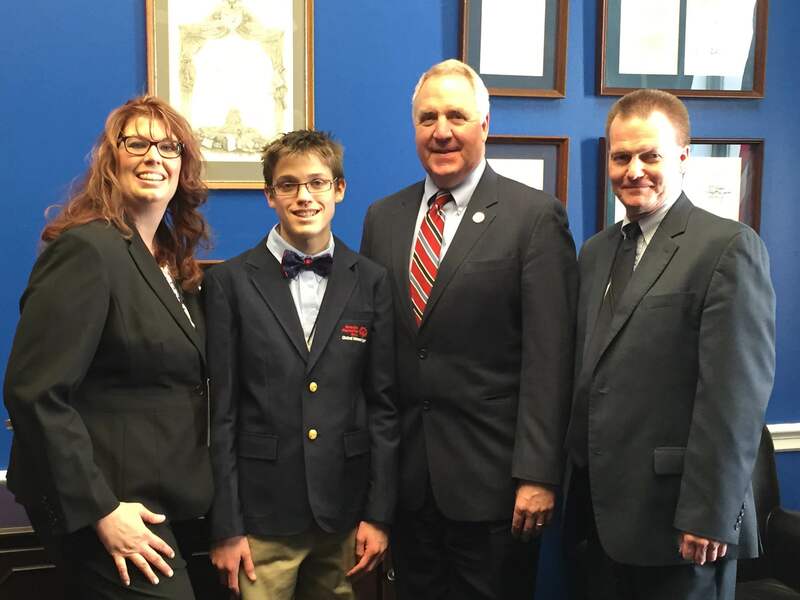 I even got to meet our representative, John Shimkus (see photo at top of page). When I was in his office, I saw had lots of baseball jerseys. I asked him why he had a Chicago White Sox jersey because around where we live, hardly anyone likes the White Sox or the Chicago Cubs, myself included. He told me they were given to him and he wears them for him playing baseball in D.C. for charity events. I told him he needs a Special Olympics Unified jersey. Rep. Shimkus also had a Cardinals jersey. I’m glad he did not have a Cubs jersey. After the meeting with the last Representative, we went to the Senate building and met with one of Sen. Mark Kirk’s assistants. After that, we went to Sen. Durbin’s office to drop some things off. We did a lot of walking. I told many people that day my story. What Special Olympics helped me achieve; how it changed many of my dreams to things I never once thought I was worthy of doing. I no longer was just a child with autism. I no longer was just a victim of bullying. I am a voice. I am important. I am a great investment. I am someone who can vote in four years. I am an amazing Global Messenger. I am part of an amazing team and I’m very proud of all the medals I have won. My goals have changed. I now plan to head to college and be on the board of the Special Olympics Illinois. From there, I want to become a Global Ambassador for Special Olympics. I was proud to be chosen to tell all the people we met my story and how Special Olympics has helped me rewrite the ending to my novel. Our day on Capitol Hill was nearly done. 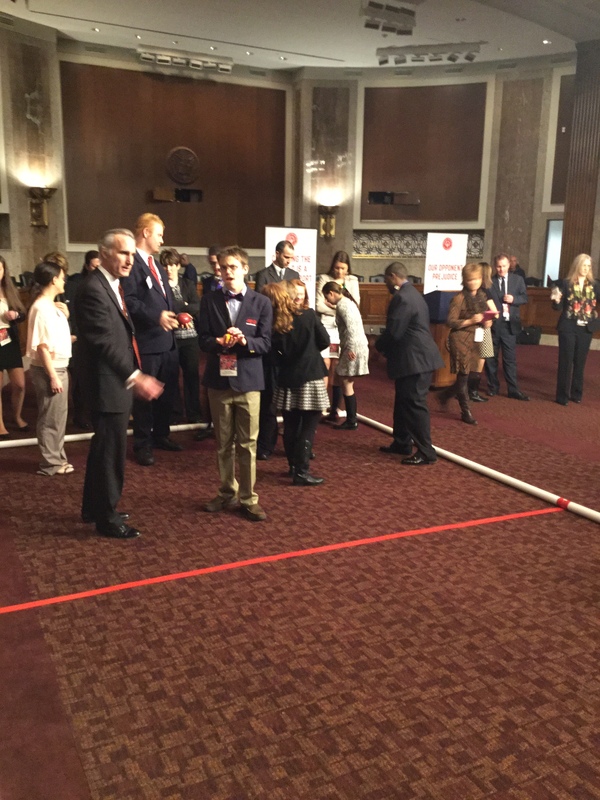 Our last stop was a reception where we played bocce to show the senators and representatives what we do. I bonded with other Global Messengers. I even got to meet Special Olympics Chairman Tim Shriver and had my picture taken with him. 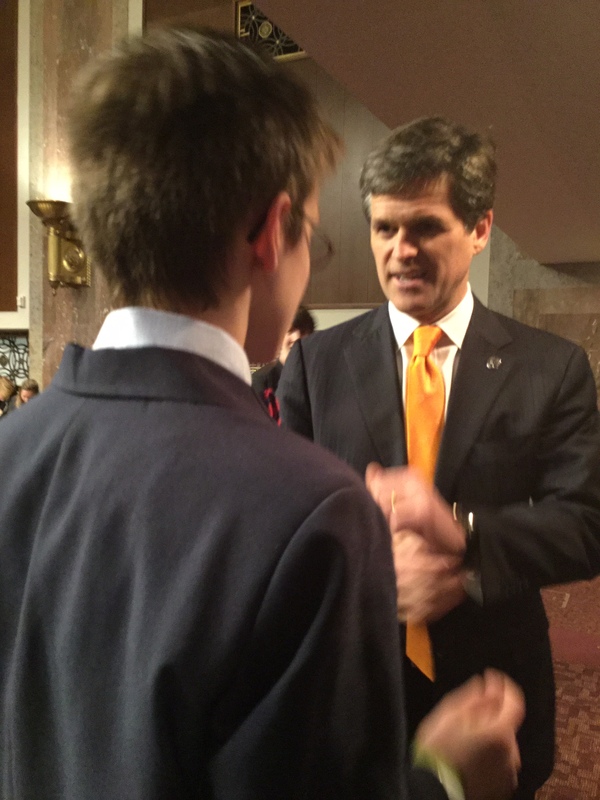 Normally, I don’t like my picture taken, but seeing Tim Shriver in real life was rare and I wanted a memory of that. After that, we got something to eat and then went back to the hotel. Thursday, March 19, we got to sleep in a little longer. For our last big adventure, we went to Arlington Cemetery. Alas, we went back to the hotel, purchased a few souvenirs to remind me of this amazing trip and boarded a bus for the airport. Dave sat by us and we even sat in front of the Missouri delegates. When we got back to St. Louis, we said goodbye to Dave and the Missouri delegates. Overall, it was an amazing experience, bonding with Dave and the other Global Messengers there. We shared our important message about Project UNIFY. The biggest thing I learned on this trip was that I am important and so are all the other Special Olympic athletes. We are important!